This book turned out to be much less twisted and much more reminiscent of Barbara Kingsolver (Prodigal Summer) than Gillian Flynn. Though this novel does have a scary, violent young Vietnam vet, a hidden gun, a lot of weird-sounding craft projects (involving looms, yarn, dirt, wood, and leaves), and a woman running away from a failed marriage. Katherine is like Mad Men’s Peggy Olson, an unusually successful woman in advertising during the era of Lucky Strike and sweater sets. But Katherine has lost her first love to Vietnam, then married an advertising colleague for convenience. When their baby dies and she becomes horrifically ill with an undiagnosed ailment, the marriage fails. When the story begins, she’s been told that although the doctors can’t determine the cause of her intense chronic pain and inability to digest food, she probably has only 3 months to live. She’s in the process of dissolving her life, selling her interest in the agency and making plans to disappear. Instead of suicide, she decides to buy a remote cabin in the mountains of Georgia. What Katherine doesn’t know is that the property she’s purchased already has another refugee from “civilization” living on it — a shell-shocked soldier nearly young enough to be her son. Danny’s hardscrabble mountain childhood and brutal, violent tour of duty in Vietnam have equipped him with mad skills in wilderness survival, stalking, and grandiose fantasizing. The novel is structured to alternate between both Danny’s and Katherine’s POVs, and there are frequent passages where one or the other is having some sort of hallucinatory fantasy about the past or an implausible future together. 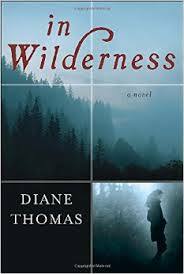 In Wilderness is definitely NOT a romance (according to the usual genre criteria), and it was interesting to read a harsh novel like this that so easily could have been a May/December romance, including a (very) few scenes where it actually seemed as if Danny and Katherine might together manage to be something good for each other. For a brief moment it’s as if the narrative “tries on” some romance tropes having to do with two damaged souls finding comfort in nature and each other. In the end, his PTSD proves more damaging than her supposedly fatal illness, and the fact that for more than half the book he is basically stalking her, before she even knows he exists, makes this much more like a creepy thriller. But it does have its Annie Dillard moments. Some of the passages describing Katherine’s visceral, intimate foraging relationship with the forest and her food garden are almost shockingly brutal, while others have the perhaps more predictable lyrical, meditative feel. The early ’60’s setting and the evocation of the Appalachian wildness are the other elements that intrigued me. I loved the brief scenes set in the town that’s a day-hike away, where they go to buy supplies and food, in large part because of the small yet important ways in which the period setting rang true — there are a full service men’s clothing store and a dress shop on the main street. Mall culture hasn’t killed off local shopping districts yet. Katherine gets a post office box which she checks infrequently and the fact that she is so isolated at the cabin doesn’t involve any sort of elaborate scheme for getting off the grid. Because: Pre-cell phones, and she doesn’t even have electricity or a land line. So there is a powerful atmosphere of isolation and vulnerability, while at the same time it was a relief to know Danny couldn’t cyber-stalk her texts or phone calls. The period setting with its lack of technology sort of cut both ways in creating a backdrop for this intense narrative of a wounded, raw love affair. Without going too far into spoiler territory, I will just conclude by saying Look Not Here for HEA. At least not for Danny and Katherine the couple.